When you move to a new area, you want to seek out a church that not only aligns with your beliefs, but also one where you feel welcome. Searching for a nondenominational church can take time. Because they do not fall under any one denomination, they all can be very different from one another. Abiding Love, an interdenominational church in Foley, AL, offers a welcoming and supportive environment, no matter your faith. Pray About It: The most important part of the process is to let God lead you to the right church. Pray for guidance in choosing the place where you’re meant to worship Him and seek out spiritual guidance. Examine Your Beliefs: Before you pick a new nondenominational church, think about your own personal beliefs and interpretations. Make sure your new church’s doctrine aligns with them. Read the church’s statement of faith to better understand their principles. Call & Visit Their Website: Before you start sitting through a bunch of different services to learn why each church isn't a great fit for you, first call your potential new church and check out their website. You can receive more information about the church that way and be able to ask specific questions that are important to you. Ask Other Local Christians: If you have any Christian friends, relatives, or coworkers in the area, ask them where they attend church. Remember, a church isn’t just a place of worship, it’s a family. Visit At Least 3 Times: Don’t make up your mind after only one visit. 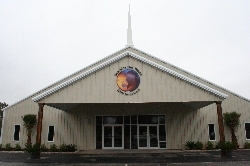 Visit a few different times to experience the worship style and the structure of the service. See what additional programs are offered that interest you. Chat with church members to understand why they choose that particular church. If you’ve recently moved to the Foley, AL area and are looking for a nondenominational church, visit Abiding Love. They offer contemporary Christian worship, bible study, and age-based ministry groups to connect you with other church members. For more information on Abiding Love, visit their website or call the church at (251) 943-1615.